The Great Smoky Mountains National Park is a United States National Park that straddles the ridgeline of the Great Smoky Mountains, part of the Blue Ridge Mountains which are a division of the larger Appalachian Mountain chain. 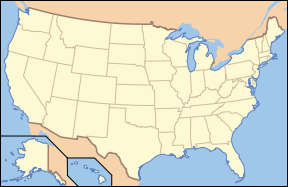 The border between Tennessee to the west and North Carolina to the east runs northeast to southwest through the centerline of the park. On its route from Maine to Georgia, the Appalachian Trail also passes through the center of the park. Before the arrival of European settlers, the area was home to the Cherokee Indians. In 1830, U.S. President Andrew Jackson signed the Indian Removal Act, beginning the process that eventually resulted in the forced removal of all Indian tribes east of the Mississippi River to what is now Oklahoma. Many of the Cherokee left the area, but some, led by renegade warrior Tsali, hid out in what is now the Great Smoky Mountains National Park. As white settlers moved in, logging grew as a major industry in the mountains and abusive practices began destroying the natural beauty of the area. In 1934 the area was officially organized as the Great Smoky Mountains National Park, gaining status as a protected area. Situated in the eastern part of the United States, its annual tourism is double that of any other national park. 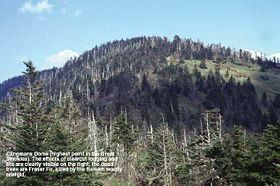 Elevations in Great Smoky Mountains National Park range from 875 to 6,643 feet (250 to 2,000 m) above mean sea level, with the highest point being Clingmans Dome. Within the park a total of sixteen mountains reach higher than 6,000 feet (1,829 m). The Great Smoky Mountains are known for its “smoky” tendrils of fog that drape the mountain ridges. The wide range of elevations mimics the latitudinal changes found throughout the entire eastern United States. Indeed, ascending the mountains is comparable to a trip from Tennessee to Canada. Plants and animals common in the Northeast have found suitable ecological niches in the park's higher elevations, while southern species find homes in the balmier lower reaches. During the most recent ice age, the northeast-to-southwest orientation of the Appalachian Mountains allowed species to migrate southward along the slopes rather than finding the mountains to be a barrier. As climate warms, many northern species are now retreating upward along the slopes and withdrawing northward, while southern species are expanding. The climate varies greatly by season and elevation. Springtime weather is the most unpredictable, especially in the higher elevations. Summer is usually hot and humid with the higher elevations being more pleasant. Fall is the driest season with warm days and cool nights and frosts starting in late September. Winter is generally moderate, but extreme conditions occur in the higher elevations. Overall, it is generally 10 to 20 degrees cooler on the mountaintops than in the lower elevations below. Precipitation averages from 55 inches (1,400 mm) per year in the valleys to 85 inches (2,200 mm) per year on the peaks. This is more annual rainfall than anywhere in the United States outside the Pacific Northwest and parts of Alaska. 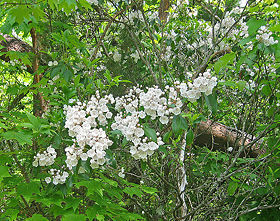 Mountain laurel growing in the park. The park is almost 95 percent forested, of which roughly a quarter is old growth with many trees that predate European settlement of the area. It is one of the largest blocks of deciduous, temperate, old growth forest in North America. The variety of elevations, the abundant rainfall, and the presence of old growth forests give the park an unusual richness of biota. About 10,000 species of plants and animals are known to live in the park, and estimates as high as an additional 90,000 undocumented species may also be present. Over 100 species of trees grow in the park. Deciduous leafy trees dominate the lower region forests. At higher altitudes, deciduous forests give way to coniferous trees like Fraser Fir. In addition, the park has over 1,400 flowering plant species such as mountain laurel, rhododendron, azalea, European red clover (a favorite with the deer population), daisies, Queen Anne’s lace, and black-eyed Susan. In addition, there are over 4,000 species of non-flowering plants. Park officials count more than 200 species of birds, 66 species of mammals, 50 species of fish, 39 species of reptiles, including 2 non-lethal poisonous snakes, and 43 species of amphibians, including 27 species of salamanders, making the Great Smokies the salamander capital of the world. The park has a noteworthy black bear population, numbering at least 1,800. An experimental re-introduction of elk (wapiti) into the park began in 2001. The best time to see elk is early morning and late evening. The ideal locations for wildlife viewing are open areas such as Cataloochee and Cades Cove. Here you are likely to spot white-tailed deer, black bears, raccoons, rabbits, turkeys, and woodchucks. Seeing deer in large numbers at sunrise is very common. Bobcats are native to Cades Cove, but are nocturnal and seldom seen. The best spots for seeing birds are Cades Cove, Oconaluftee, and the Sugarlands Visitors’ Center. Some common species are mourning doves, blue jays, eastern bluebirds, eastern meadowlarks, cardinals, sparrows, red-wing blackbirds, chickadees, and wild turkeys. The golden eagles arrive in the fall. John Cable Homestead in Cades Cove. Before the arrival of European settlers, the region was part of the homeland of the Cherokee Indians. White frontiers people began settling the land in the 18th and early nineteenth centuries. In 1830, President Andrew Jackson signed the Indian Removal Act, beginning the process that eventually resulted in the forced removal of all Indian tribes east of the Mississippi River to what is now Oklahoma. Many of the Cherokee left the area, but some, led by renegade warrior Tsali, hid out in what is now the Great Smoky Mountains National Park. Some of their descendants presently live in the Qualla Reservation south of the park. As white settlers moved in, logging grew as a major industry in the mountains. Cut-and-run style clear-cutting was destroying the natural beauty of the area, so visitors and locals banded together to raise money for preservation of the land. The U.S. National Park Service wanted a park in the eastern United States, but did not want to spend much money to establish one. Though Congress had authorized the park in 1926, there was no nucleus of federally owned land around which to build a park. John D. Rockefeller, Jr. contributed $5 million, the U.S. government added $2 million, and private citizens from Tennessee and North Carolina contributed to the fund to purchase the land for the park, piece by piece. The park was officially established on June 15, 1934. During the Great Depression, the Civilian Conservation Corps, the Works Progress Administration, and other federal organizations made trails, fire watchtowers, and other infrastructure improvements to the park. The park was designated an International Biosphere Reserve in 1976, and was certified as a UNESCO World Heritage Site in 1983. John Oliver (1793–1863), a veteran of the War of 1812, and his wife Lucretia Frazier (1795–1888) were the first permanent European settlers in Cades Cove, a small settlement originally established by the Cherokee. Originally from Carter County, Tennessee, they arrived in 1818, accompanied by Joshua Jobe, who had initially persuaded them to settle in the cove. While Jobe returned to Carter County, the Olivers stayed, struggling through the winter and subsisting on dried pumpkin given to them by friendly Cherokee. In 1821, a veteran of the Revolutionary War named William "Fighting Billy" Tipton (1761–1849) purchased large tracts of Cades Cove, which he in turn sold to his sons and relatives. In the 1820s, Peter Cable, a Pennsylvania Dutch farmer, arrived in the cove and designed an elaborate system of dykes and sluices that helped drain the swampy lands in the western areas of the cove. Robert Shields arrived in the cove in 1835, and erected a tub mill on Forge Creek. His son, Frederick, built the Cove's first gristmill. Between 1820 and 1850, the population of Cades Cove grew to 671, with the size of cove farms averaging between 150 and 300 acres. The early cove residents, although relatively self-sufficient, were dependent upon nearby settlements for dry goods and other necessities. The isolation often attributed to Cades Cove is probably exaggerated. A post office was established in the cove in 1833, and Sevierville postmaster Philip Seaton set up a weekly mail route to the cove in 1839. Cades Cove had phone service as early as the 1890s. By the 1850s, various roads connected Cades Cove with nearby towns, some of which are still maintained as seasonal passes or hiking trails. Cades Cove would suffer from the effects of the Civil War for most of the rest of the 1800s. Only around 1900 did its population return to pre-war levels. The average farm was much less productive, however, and the cove residents were suspicious of any form of change. It wasn't until the Progressive Era that the cove recovered, economically. Religion was an important part of life in Cades Cove from its earliest days, due in large part to the efforts of John and Lucretia Oliver. The Olivers organized a branch of the Miller's Cove Baptist Church in 1825. After briefly realigning themselves with the Wear's Cove Baptist Church, the Cades Cove Baptist Church was pronounced an independent entity in 1829. In the 1830s, a division in Baptist churches known as the Anti-mission Split occurred throughout East Tennessee. The split was due to a debate over whether or not missions were authorized by scripture. This debate made its way to Cades Cove Baptist Church in 1839, becoming so emotionally charged as to require the intervention of the Tennessee Association of United Baptist. In the end, 13 members of the congregation departed to form the Cades Cove Missionary Baptist Church later that year, and the remaining congregation changed their name to the Primitive Baptist Church in 1841. The Primitive Baptists believed in a strict, literal interpretation of Biblical scripture. The Primitive Baptists would remain the dominant religious and political force in the cove, their meetings interrupted only by the Civil War. The Missionary Baptists, with a much smaller congregation, would continue to meet on and off throughout the 19th century. The Cades Cove Methodist Church was organized in the 1820s, probably due to the efforts of circuit riders such as George Eakin. The Methodist congregation, like that of the Missionary Baptists, was relatively small. The Great Smoky Mountains National Park is a major tourist attraction in the eastern part of the United States; over 9 million tourists and 11 million non-recreational visitors travel to the park each year, double that of any other national park. It is within a day’s drive of a third of the population of the U.S. Surrounding towns, notably Gatlinburg, Pigeon Forge, Sevierville, and Townsend in Tennessee, and Cherokee, Sylva, Maggie Valley, and Bryson City in North Carolina receive a significant portion of their income from tourism associated with the park. The two main visitors’ centers inside the park are Sugarlands Visitors’ Center near the Gatlinburg, Tennessee entrance and Oconaluftee Visitors’ Center near the town of Cherokee, North Carolina at the eastern entrance to the park. Ranger stations provide exhibits on wildlife, geology, and the history of the park, as well as maintain souvenir shops. Newfound Gap with an elevation of 5,048 feet (1,539 m) is a mountain pass located near the center of the park. Situated along the border of Tennessee and North Carolina, the state line divides the gap, as does U.S. Highway 441 (also known as Newfound Gap Road), on its way over the mountains between Gatlinburg, Tennessee and Cherokee, North Carolina. The Appalachian Trail also traverses the gap, as do a small number of other hiking trails. Newfound Gap is also home to the Rockefeller Memorial, a popular destination within the park and the site from where former President Franklin Delano Roosevelt formally dedicated the park on September 2, 1940. Prior to the development of the Great Smoky Mountains National Park, Newfound Gap was an undiscovered pass two miles east of what was long thought to be the lowest mountain pass over the Great Smoky Mountains, Indian Gap. Indian Gap Road, an unpaved, arduous trail frequented by traders, farmers, and even by the Confederate Army during the American Civil War, was completed in 1839 and named after the old Cherokee Indian trail that the road paralleled. Newfound Gap itself was not recognized as the lowest gap over the mountains until 1872, when Arnold Guyot measured many of the mountains in the area and determined the "Newfound Gap" to be a lower, more accessible mountain pass. With the development of the National Park came the construction of a newer, more modern highway from Tennessee to North Carolina, completed in 1932, this time crossing Newfound Gap, replacing the now defunct Indian Gap Road. One of the most well-preserved historical attractions in the park, and the most popular, is Cades Cove, a valley with a number of preserved historic buildings including log cabins, barns, and churches. Cades Cove, though geographically isolated, is the single most frequented destination in the park. Self-guided automobile and bicycle tours offer the many sightseers a glimpse into the way of life of old-time southern Appalachia. By 1797, and probably much earlier, the Cherokee had established a settlement in Cades Cove known as "Tsiya'hi," or "Otter Place." This village, which may have been little more than a seasonal hunting camp, was located somewhere along the flats of Cove Creek. Henry Timberlake, an early explorer in East Tennessee, reported that streams in this area were stocked with otter, although the otter was extinct in the cove by the time the first European settlers arrived. Cades Cove was named after a Tsiya'hi leader known as Chief Kade, of whom little is known. Abrams Creek, which flows through the cove, was named after another local chief, Abraham of Chilhowee. The Treaty of Calhoun in 1819 ended all Cherokee claims to the Smokies, and Tsiya'hi was abandoned shortly thereafter. The Cherokee would linger in the surrounding forests, however, occasionally attacking settlers until 1838 when they were removed to the Oklahoma Territory. 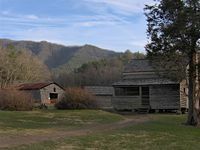 The National Park Service currently maintains several buildings in Cades Cove that are representative of pioneer life in nineteenth-century Appalachia. It's important to note that by the time the cove was incorporated, most residents lived in relatively-modern frame houses, rather than log cabins. 1. The John Oliver Cabin, constructed c. 1822-1823 by the cove's first permanent European settlers. Dunn reports that the Olivers spent the winter of 1818-1819 in an abandoned Cherokee hut, and built a crude structure the following year. The Oliver Cabin was built as a replacement for this first crude structure, which was located a few meters behind the cabin. 2. The Primitive Baptist Church, constructed in 1887. The church was organized as the Cades Cove Baptist Church in 1827, and renamed "Primitive Baptist" after the Anti-missions Split in 1841. The Olivers and Russell Gregory are buried in its cemetery. 3. The Cades Cove Methodist Church, constructed in 1902. Methodists were active in the cove as early as the 1820s, and built their first meeting house in 1840. 4. The Cades Cove Missionary Baptist Church, constructed in 1894. The church was formed from a small faction of Cades Cove Baptists in 1839 who had broken off from the main church due to the debate over missions, which the Cades Cove Baptists didn't consider authorized by scripture. 5. The Elijah Oliver Place, constructed in 1866. Elijah Oliver (1829-1905) was the son of John and Lucretia Oliver. His original farm was destroyed during the U.S. Civil War by Confederate marauders. The homestead includes a dog-trot cabin, a chicken coop, a corn crib, and a crude stable. 6. The John Cable Grist Mill, constructed in 1868. John P. Cable (1819-1891), a nephew of Peter Cable, had to construct a series of elaborate diversions along Mill Creek and Forge Creek to get enough water power for the mill's characteristic overshot wheel. 7. The Becky Cable House, constructed in 1879. This building, adjacent to the Cable Mill, was initially used by Leason Gregg as a general store. In 1887, he sold it to John Cable's spinster daughter, Rebecca Cable (1844-1940). A Cable family tradition says that Rebecca never forgave her father and refused to marry after her father broke off one of her childhood romances. Various buildings have been moved from elsewhere in the cove and placed near the Cable mill, including a barn, a carriage house, a chicken coop, a molasses still, a sorghum press, and a replica of a blacksmith shop. 8. The Henry Whitehead Cabin, constructed 1895-1896. This cabin, located on Forge Creek Road near Chestnut Flats, was built by Matilda "Aunt Tildy" Shields and her second husband, Henry Whitehead (1851-1914). Shields' sons from her first marriage were prominent figures in the cove's moonshine trade. 9. The Dan Lawson Place, built by Peter Cable in the 1840s and acquired by Dan Lawson (1827-1905) after he married Cable's daughter, Mary Jane. Lawson was the cove's wealthiest resident. The homestead includes a cabin (still called the Peter Cable cabin), a smokehouse, a chicken coop, and a hay barn. 10. The Tipton Place, built in the 1880s by the descendants of Revolutionary War veteran William "Fighting Billy" Tipton. The paneling on the house was a later addition. Along with the cabin, the homestead includes a carriage house, a smokehouse, a woodshed, and the oft-photographed double-cantilever barn. 11. The Carter Shields Cabin, a rustic log cabin built in the 1830s. The park has a wide variety of activities and destinations to explore, including scenic driving, hiking, backpacking, bicycling, fishing, camping, horseback riding, and picnicking, as well as exploring the cultural history of the area through educational programs. Including seventy miles of the Appalachian Trail, there are 850 miles (1,368 km) of trails and unpaved roads in the park for hiking. 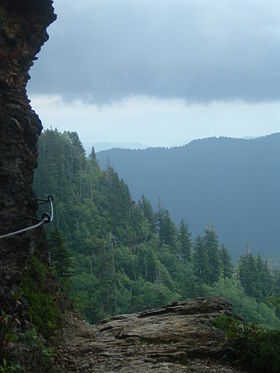 Mount Le Conte, at 6,593 feet (2,009 m), is the third highest summit in the park; measured from its base to its highest peak, is the tallest mountain east of the Mississippi River. Inasmuch it is one of the most frequented destinations in the park. Its Alum Cave Trail, which is the most heavily traveled of the five paths en route to the summit, provides many scenic overlooks and unique natural attractions, such as Alum Cave Bluffs and Arch Rock. Accessible solely by trail, it is the only private lodging available inside the park. Another popular hiking trail leads to the pinnacle of the Chimney Tops, so named because of its unique dual-humped peak tops. This short but strenuous trek rewards nature enthusiasts with a spectacular panorama of the surrounding mountain peaks. The Laurel Falls Trail is heavily traveled for the first 1.3 miles until it reaches the powerful 80-foot (24-m) waterfall. Due to a number of slipping accidents, a bridge was built in 1995 over the Laurel Branch. Clingman’s Dome Trail takes visitors on a half-mile uphill climb to a fifty-foot observation deck. This is the highest point along the Appalachian Trail and on a clear day offers a 360-degree view of the surrounding Tennessee and North Carolina mountains. In addition to day hiking, the park offers opportunities for backpacking and camping, particularly via the placement of shelters along the Appalachian Trail; designated campsites are also scattered throughout the park. As plans to create a national park in the eastern United States began to unfold in the 1920s, specifically in the area of eastern Tennessee and western North Carolina, various organizations began the process of procuring lands and constructing for the anticipated park. At the same time, the Great Depression had wrought havoc among the nation’s people, leaving many homeless and unemployed. One of the organizations then-president Rossevelt created, the Civilian Conservation Corps (CCC) was instrumental in the development of the hiking trails and campsites in the park. Many of the hundreds of miles of trails in the park were dug by the CCC in its formative years, with some still in place today. Other hiking trails were in use hundreds of years ago. Before the settlement of whites, the region was a small portion of the expansive Cherokee territory. The Cherokee often traveled over the mountains via established routes for trading and reaching hunting grounds away from their homes. Over the years with the steadying encroachment of white settlers, many of the old Cherokee mountain roads were adapted to the uses of the new settlers and, eventually, a few of these were converted to hiking trails in today's park. In addition to the work of the Civilian Conservation Corps and mountain routes of the Cherokee Indians, various hiking clubs have also worked to improve upon currently established trails and to construct entirely new trails in their own right. Perhaps the most popular of these, the Appalachian Trail Conservancy, which promotes the conservation of the Appalachian Trail, works through an affiliated club to maintain the trail within the national park. Other similar groups perform similar functions on trails throughout the park. Fishing is popular activity in the park and is permitted year-round. The park has over 2,100 miles of streams within its boundaries and protects one of the last wild trout habitats in the eastern U.S. Most streams remain at carrying capacity for both trout and smallmouth bass offering a great opportunity to catch these species throughout the year. There are about 550 miles of the park’s hiking trails that are open to horses. You can bring your own horse and stay at a horse camp that provides ready access to backcountry horse trails throughout the park, or rent a horse on an hourly basis. There are several stables located within the park. The Great Smoky Mountain Institute at Tremont provides year-round educational workshops and programs for all ages. Programs may include wildlife slide shows and demonstrations, hiking, and mountain music or living history. The Smoky Mountain Field School offers programs for families and adults that vary in time from four hours to two days. They cover various aspects of natural and cultural history of the area. There are also Park Ranger-guided programs throughout the summer and fall, which are offered to the public for free. Great Smoky Mountains National Park. Earth Observatory. Retrieved May 19, 2007. Uhler, John William. Great Smoky Mountains National Park, Great Smoky Mountains National Park. Retrieved June 19, 2007. Great Smoky Mountains. National Park Service. Retrieved May 19, 2007. Saferstein, Mark. 2004. Great Smoky Mountains, 22nd ed. American Parks Network. Tilden, Freeman. 1968. The national parks. New York: Knopf. Thornborough, Laura. 1937. The Great Smoky mountains. New York: Thomas Y. Crowell Co. Explore the Great Smoky Mountains. Great Smoky Mountains Association. History of "Great Smoky Mountains National Park"
This page was last modified on 14 July 2017, at 22:15.